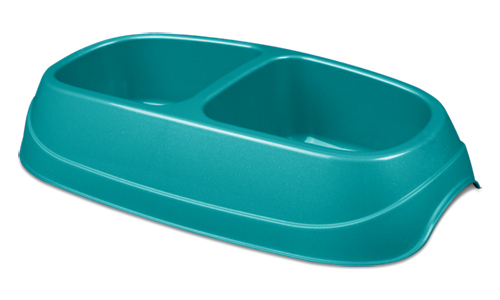 The Large Double Pet Dish offers a generous 50 ounce capacity that is ideal for all size pets. It offers a polished finish with a textured accent for a stylish look in the home and is perfect for dry kibble, wet food, treats or water. 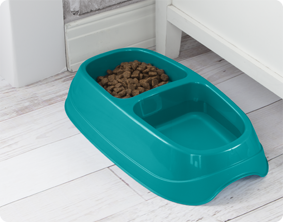 The double dish feature makes it simpler for your pet to eat and drink with ease. It features a durable no-tip design and cutouts in the base that makes picking up and moving the dish easy and comfortable. This pet dish has a smooth surface that is dishwasher safe and an easy-to-clean. This item is BPA-free and phthalate-free. The overall dimensions of this item are 14" L x 7 5/8" W x 3" H.
Overall Assembled Size: 14" x 7 5/8" x 3"
The Large Double Pet Dish is ideal for food and water for medium to large sized pets. Large Double Pet Dish is rated 5.0 out of 5 by 2. Rated 5 out of 5 by momby from So convenient Great for pets, like that it stays put, just the right size for my pet, i also like that it can hold both water and food. Rated 5 out of 5 by Anonymous from Great to have for pets! 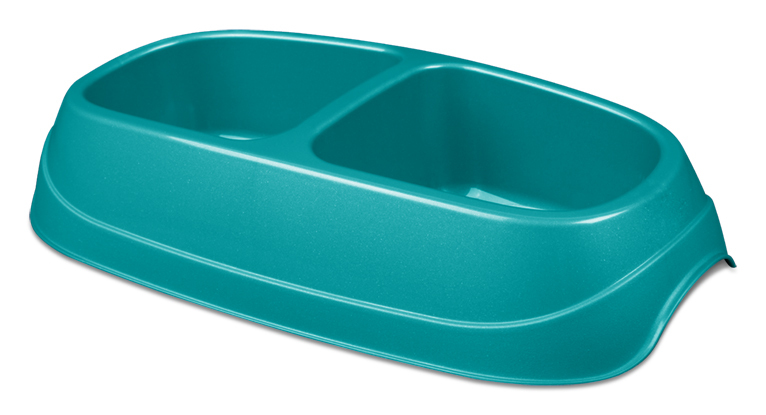 I love this large capacity double dog dish, my dogs always know we are going the desert when they see this product. It's great to hold lots of water and food. I would recommend this to anyone for their home or away. Durable and looks great anywhere!